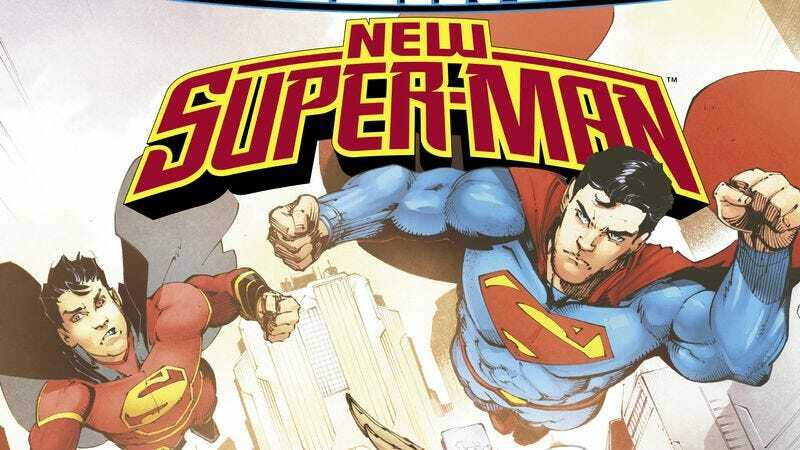 New Super-Man has been carving its own corner of the DC Universe as it introduces Kenan “Super-Man” Kong and the Justice League of China, but it’s latest arc, “Coming To America,” takes Kenan to Metropolis to integrate him into the larger DCU. That means a team-up with the city’s two other Supermen, Clark Kent and Lex Luthor, and the three of them have to work together to stop a swarm of demons that have escaped from hell. Writer Gene Luen Yang has done exceptional work using Chinese politics, philosophy, and mythology to inform the storytelling on this series (read more about it in this Big Issues on last month’s issue), and by giving in to the temptation to gain his powers quickly, Kenan literally opens the gates of Diyu, the underworld of Chinese legend. This preview of next week’s New Super-Man #10 brings Clark Kent into the fold to help take out the China White Triad, but there’s a much bigger threat on the way when Kenan foolishly opens the gate to Diyu again. Penciler Viktor Bogdanovic has a skill for big dramatic moments, and the opening shot of Superman and the two-page spread of demons rushing out of Diyu have an intense energy behind them. That energy is amplified by Jonathan Glapion’s slick inks and Mike Spicer’s vibrant coloring, and the latter reinforces the fantastic nature of the demons by embracing a wide spectrum of bright colors. This art team knows how to deliver spectacular superhero action, and as the stakes get higher, readers can expect even more excitement in the pages of New Super-Man.